Consider Urban Growler® Brewing Company for your next event! We offer several appealing spaces perfect for many occasions. 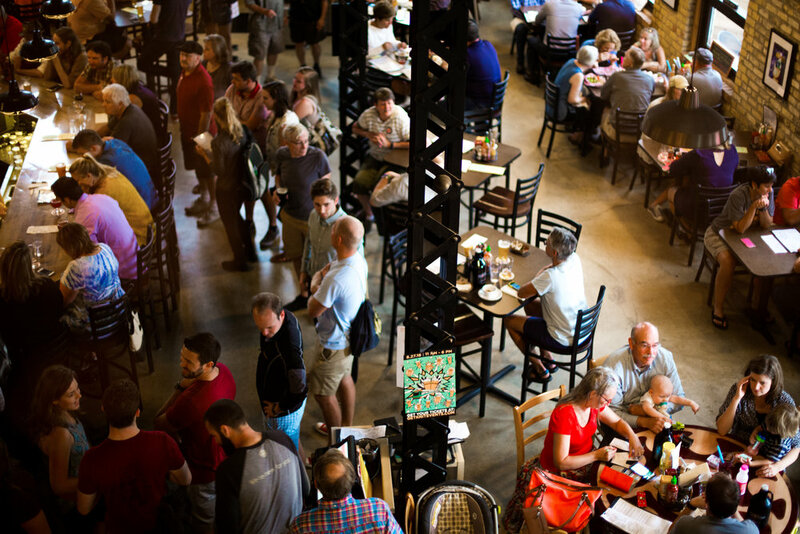 The neighborhood atmosphere, specialty house-made beers and tasty food menu come together to create a memorable event for you and your guests. Below is our room rental information, current catering menu, and private events contract. Please contact Liz@urbangrowlerbrewing.com for availability and further questions. Our second floor Hayloft overlooking the Taproom, is a welcoming space for groups up to 49 people, and it ACTUALLY was a hayloft or carriage service space in days of old! The space can be configured for seated meetings or cocktail height tables for receptions and socializing. Contact us for further details on the space. Taproom is available for rent on Mondays only. Contact us for pricing, capacity, and further details. For parties of 8 people or more- we will always do our best to accommodate your group though we may not be able to seat you at the same table or near each other. On busier night we may have to split your party up into two groups and seat you at different times as well. Beer Garden is available for rent on Mondays only. Contact us for pricing, capacity, and further details. We no longer reserve portions of the Beer Garden for parties. All parties are served on a first come-first serve basis.